Usually when I work in my studio I try to tidy as I go putting paints back in order so that I can quickly lay hands on them again when needed. At the end of the day I tidy up ready for the morning. 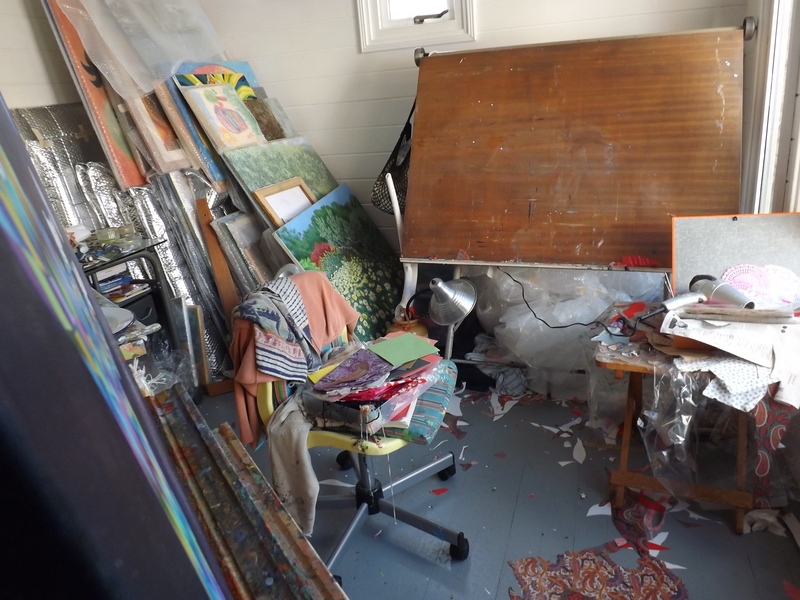 Now my studio looks like the aftermath of some sort of disaster after making two collages. I have collected interesting papers and keep them in a box but when working under pressure to meet a deadline my careful system of folding leftover scraps to use in the future all went to pot. The result looks as though Atilla the Hun has been on the rampage and today I am faced with the daunting task of getting it all back into some sort of order. All those scraps I so carelessly dropped to the floor in my fever of creation have to be picked up tucked away in their box, What DO artists do all day ?